...and making the crux slap. 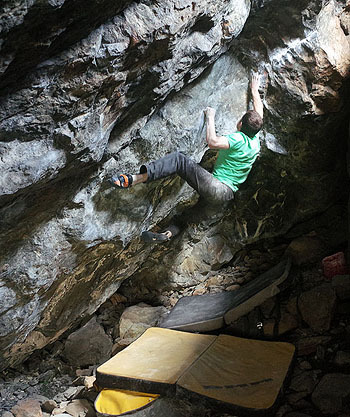 Last night Pete Robins climbed an excellent project line in the Barrel Cave, the shady lean-to which sits below Dinas Mot in the Llanberis Pass. Ropes of Maui 8B starts sitting at the base of the obvious ramp system and follows it rightwards to join Stoned Temple Pilots at the diagonal sidepull hold. (NB. Stoned Temple Pilots starts sitting with left hand on the sidepull and right on a low undercut pinch). Stoned Temple Pilots was originally given 8A+ but after a number of repeats it has settled at 8A. The new section on Ropes of Maui only amounts to four moves but the climbing is very intense with a number of hard foot movements and considerable body tension required to hold the positions. On its own this section rates about 7C+/8A and it leads without respite into the powerful crux slap on Stoned Temple Pilots. 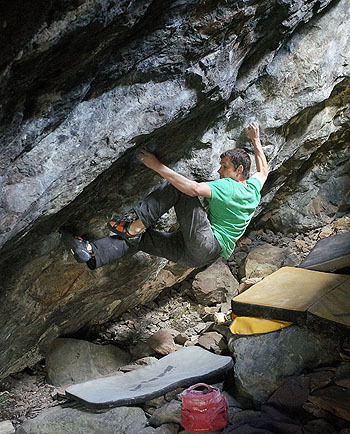 Pete originally toyed with the moves back in 2010 when he repeated Stoned Temple Pilots and The Tracks 8A+ (he also climbed the first ascent of the sds to the Original Problem at the time). This year he became interested in the line again but by a random twist of fate found himself in direct competition with rising star Wiz Fineron. Wiz was doing well on it and Pete feared that he might be beaten to the finishing line. Luckily for Pete Wiz disappeared off on more of his globe-trotting travels before he could nail it (he’s currently in South Africa). With Wiz out of the picture Pete settled into redpoint siege mode and started to break down the defences of the problem. 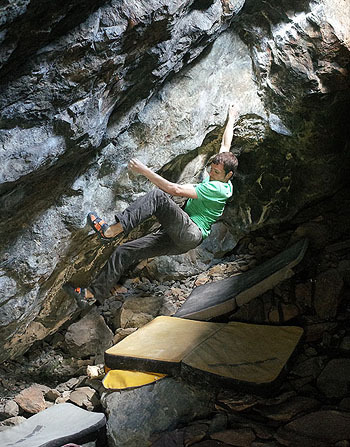 Soon he was hitting the crux slap, but not quite holding it, and doing this a few times in every session. He also had Stoned Temple Pilots completely wired and could do it every time, even when tired at the end of a session. Nonetheless the successful link remained, dismayingly, just out of reach. With success so tantalisingly close he knew he just had to keep coming back and hope for some decent conditions. Finally, after several frustrating sessions, it all came good and Pete found himself climbing up through the exit slot to a victorious top out on the upper slab. STP ext start 8B from Simon Panton on Vimeo.